Nobody cares about this neighbourhood like the people who live right here. There is no big charity and no level of government that focusses on Fernwood—that is where we come in. Fernwood Neighbourhood Resource Group is a non-profit social enterprise working for the awesomeness of Fernwood. We offer quality programs, activities and care to the very young, young at heart, and everyone in between: innovative programs and services that improve the quality of life for all Fernwoodians. We provide affordable housing units, child care, family programming, and many recreational and environmental activities to build and maintain the healthy and prosperous neighbourhood we all want to grow up and live in. If you are able, any donation to our organization is gratefully appreciated. Unrestricted donations allow us to best respond to emerging needs while targeted donations can be put towards specific projects and programs, such as the Gift of Good Food (fresh produce for families who need it), Family Programming, Fernwood Family or Student Dinners, FernFest, our Kitchen Garden and Community Orchard, Spring Ridge Commons, or the Fernwood Pole Painting Project. With your help, what more can we achieve? 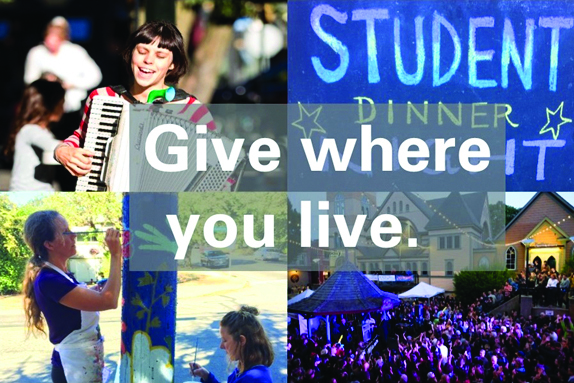 Fernwood would not be the vibrant neighbourhood village it is today without your donations. Gifts of time, money and assets were crucial in the purchase and revitalization of the Cornerstone Building and creation of affordable housing at Park Place, the Cornerstone Apartments, and now the new building at 1310 Gladstone. Iconic events like FernFest rely on an award-winning team of volunteers, as does Pole Painting—even our chef needs volunteers to help with Family Dinner. Since 2015, we have fundraised during the Christmas season to provide families with a bag of fresh fruit and vegetables every other week for an entire year through the Gift of Good Food. The number of families helped with this amazing, nutritious (and about half local) food has grown from a half-dozen families in the first year to over 160 in 2018. All of our public sponsors and donors are featured on our website, as well as in our Annual Report. If you would prefer to speak with someone about your donation, please contact our Director of Development, Lenore, by phone at 250-381-1552 ext.115 or email lenore [at] fernwoodnrg.ca.